John Lamont MSP visited Larriston Farm in the Scottish Borders to witness the planting of over 1 million trees as part of a major new productive forest. “BSW Timber is the UK’s leading sawmiller. A Scottish-based family business, we employ over 1,200 people. We need new forests like this to ensure a sustainable supply of timber for future generations. Hamish Macleod of BSW; Jason Sinden of Tilhill Forestry; John Lamont MSP; Eddie Addis of Tilhill Forestry and contractor Simon Richardson. 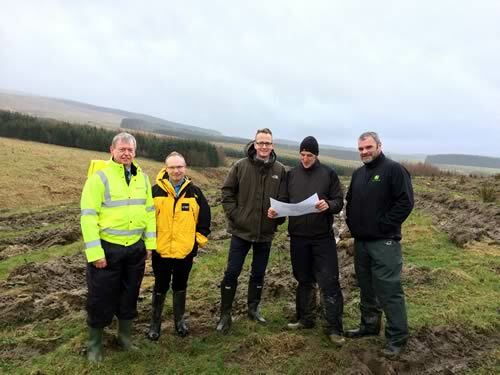 “I was delighted to pay a visit to the Tilhill Forestry managed Larriston site in Liddesdale. Forestry is an important contributor to the local economy in the Borders and parent company BSW Timber, based in the Borders, is a major employer. The ground preparation is being carried out by contractor Simon Richardson, who has developed a range of purpose-built machines to cope with different soil conditions and slopes. Tilhill Forestry Ltd, a wholly owned subsidiary of the BSW Timber Group, was established nearly 70 years ago. It is a national company operating from a network of offices throughout the UK. The company provides a full range of consultancy and contracting services to the forest owner and forestry investor. BSW is the most technologically advanced sawmill in the UK employing over 1,200 people. The Company’s roots date back to 1848, and with seven sawmills in the UK and one in Latvia, has a production capacity of more than 1.2 million m3 of sawn timber which is distributed throughout construction, fencing and landscape markets.